Sounds incredibly boring doesn’t it? Laundry day! Laundry day when living in a motorhome takes on a whole new way of looking at things. We don’t have a washing machine, we don’t have a garden, we don’t have room in the van to hang things! So we have to be resourceful, pick the right days with the right weather! 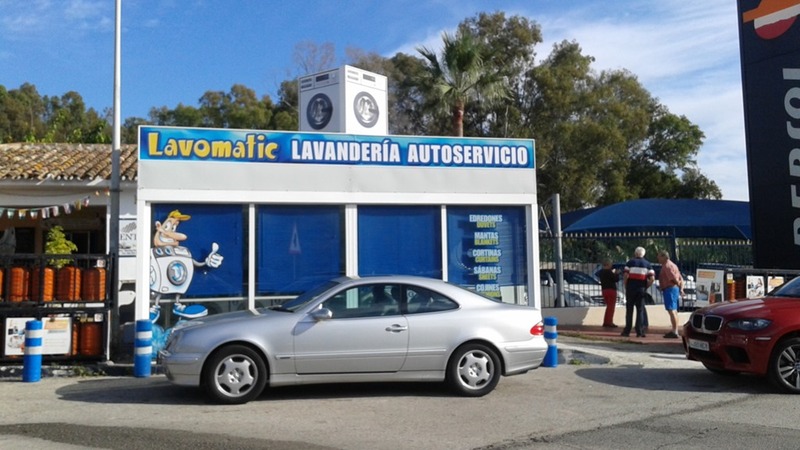 There is a washing machine on site and it costs 3.50 Euros, which is fine for washing everyday clothing, but it isn’t big enough for larger items. We normally do a little bit of hand-washing every day. Today, I noticed that we’ve been a little lazy and have let quite a pile of dirty washing accumulate, so I paid up and did a load of washing, which is now hanging on our makeshift line, a piece of cord attached to two trees! We have a couple of bedspreads and throws that are looking decidedly grim, so we set off this morning in search of larger washing machines. We found some in the most unlikeliest of places … at the petrol station on the dual carriageway. I went in with my two large throws under my arm and my washing detergent in a carrier bag. I had a look at the instructions … okey dokey, you have to buy a token at the garage, so I traipse over across the forecourt with my dirty washing trailing behind me! “Why didn’t I put it in a bag?” and “Thank goodness I don’t have my smalls with me’” were just two of the thoughts going through my mind as I queued up behind blokes paying for their petrol! I got the token. Now why is it, even when there are clear instructions, I end up getting in a mess? It’s as though my brain closes down, I have no excuse it was written in Spanish, German and of course English! Honestly, I’ve owned many washing machines in my time, but just because this was on a Petrol Station Forecourt, all common sense just up and left, the brain had some kind of seizure and I’m stood there totally blank, like a total idiot, talking out loud and still not managing to work it out! “No, you fool, select the programme then insert the token!” I knew what I had to do, I just couldn’t do it! I got there eventually with help from a German lady who had either waited until she had absolutely no clean clothes left or she had a family of 12! I’ve never seen so much washing, she had 3 machines on the go and 2 massive tumble dryers, she had piles of clothes all out on a table and she was folding them up. Hope she doesn’t iron – she’d be at it for a month! On our way back from the ‘laundry’ we decided to take a little detour and went exploring, we found a lovely, little, pebbly beach for Charlie to have a bit of a paddle. 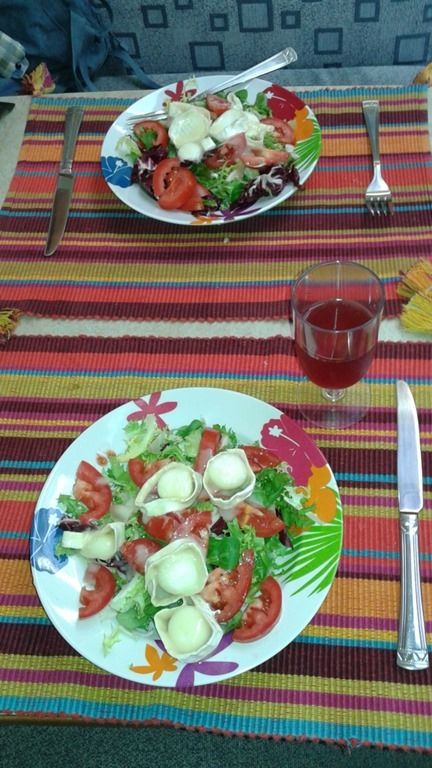 We then set about lunch, today we had salad with pan-fried goat’s cheese, with a honey and balsamic dressing (with the obligatory glass of chilled pink). Honestly washing day has never been such fun! I’m loving it. I just hope that the sun continues to shine and there’s also a breeze today so hopefully all will be dry by bedtime and no ironing, I could so get used to this. 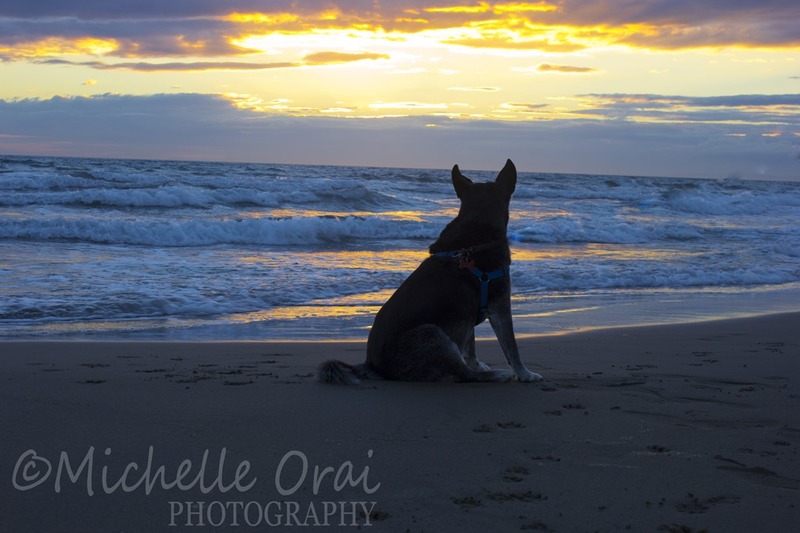 Last night we wondered down to the beach to see the sunset, even Charlie sat and enjoyed the view … such a cultured dog!! Oh I knew I had something else to tell you, we have some new neighbours, they are Scottish and they have a pet with them. Not a cat, not a dog but an African Grey Parrot called Chicco. This bird can talk!! I had a message from a blog reader suggesting we teach him some new words – I’d better keep the Hubster away as he’d find it very amusing to teach him something rather naughty. It is very odd though coming out of the van door this morning, sitting down to drink my coffee and I received a wolf whistle and a good morning! (I can tell you I’ve not had a wolf whistle since I was a teenager) maybe that’s why I’m in such a good mood today! Oh and more good news … our friends are coming over for just three days next week, it’s going to be so brilliant to catch up with them. Happy, Happy, Happy!! 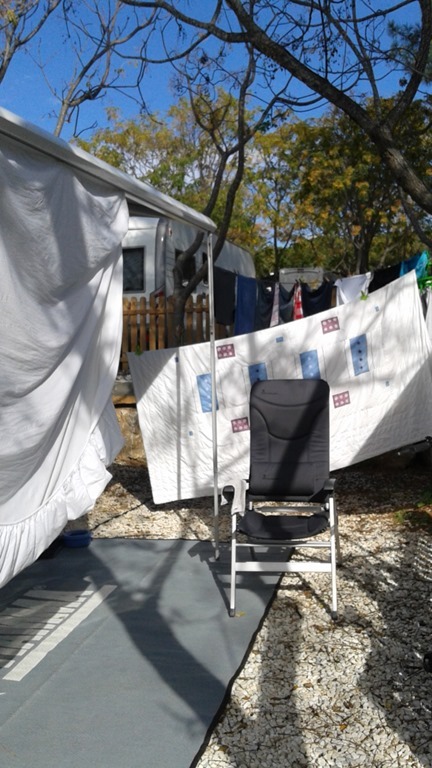 This entry was posted in Daily life, Dogs, Hidden Gypsy, Hymer, motorhome, motorhoming, Motorhoming in Spain, Photos, Spain and tagged beach, Beach Sunset, Dogs, hidden gypsy, Laundry, Lunch, Motorhome laundry, motorhoming in Spain, Photography, Spain, Sunset, washing. Bookmark the permalink. I also hate that I sometimes have those brain disconnects, and glad it all worked out. 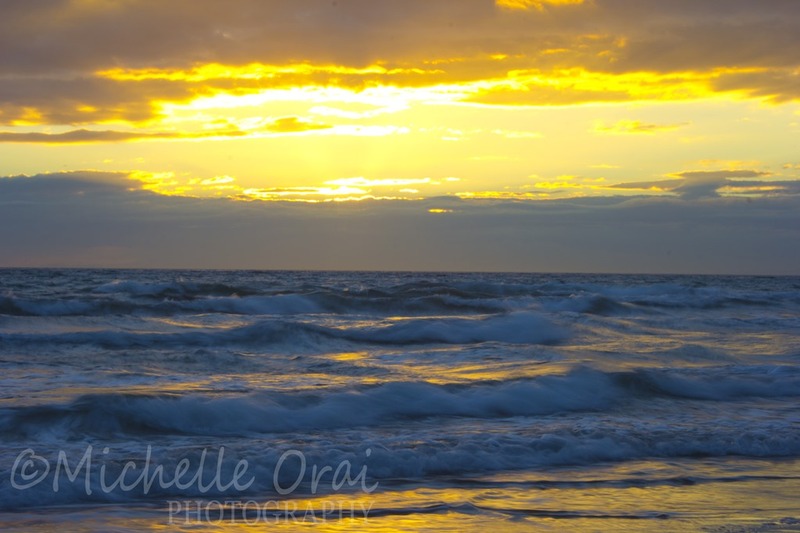 I simply love the picture of Charlie watching the sunset. Some days turn out perfect despite the bubbles in them. Yes why is it that all common sense just disappears? Must be a “lady” thing 🙂 oh we’ve had more bubbles today! Honestly we seem to lurch from one hiccough to another!